If you’ve any interest in the growing art of paraglider acro, you need a copy of ‘Acrobatics’ in your life. This is a ground-breaking book. 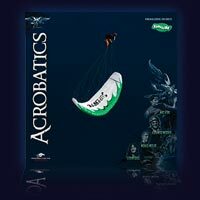 Written, photographed and produced by the German team of Gudrun Öchsl, Mike Küng, Alexander Meschuh and Michael Nesler, ‘Acrobatics’ is a 156 page visual extravaganza that tackles acro instruction head on. Colourfully designed with inspirational images, Acrobatics gives you clear and concise instructions and takes you step-by-step through each manoeuvre using both written descriptions and motor driven photo sequences. Starting with the basics like Wing-Overs and Full Stalls, the book progresses through every conceivable manoeuvre to the most difficult configurations like the MacTwist and Infinite Tumble. Once you’ve mastered those (!) you can move on to the sections on transitions – Helico to SAT, MacTwist to Helico etc. Theoretically, by the time you’ve finished Acrobatics you should have all the information you need to take the Rodriguez brothers on head-to-head at an acro comp - provided that is you’re an acro genius too. Acrobatics even discusses topics like training plans, sources of error, psychology, D-Bagging and your legal position as an acro pilot.